When we make recommendations on UK carbon budgets, we must consider the impact of low-carbon policies on energy bills, under the terms of the Climate Change Act. Improvements in energy efficiency have reduced household consumption of electricity by 23% and gas by 17%.This has saved households around £290 per year since 2008. This saving offsets the £105 paid towards low-carbon policies. The cost of shifting to low-carbon electricity will continue to increase slowly. But households are likely to offset this cost because energy efficiency will bring bills down. Low-carbon policies increase energy prices for businesses. But they only have a small impact on overall production costs for the majority of businesses. 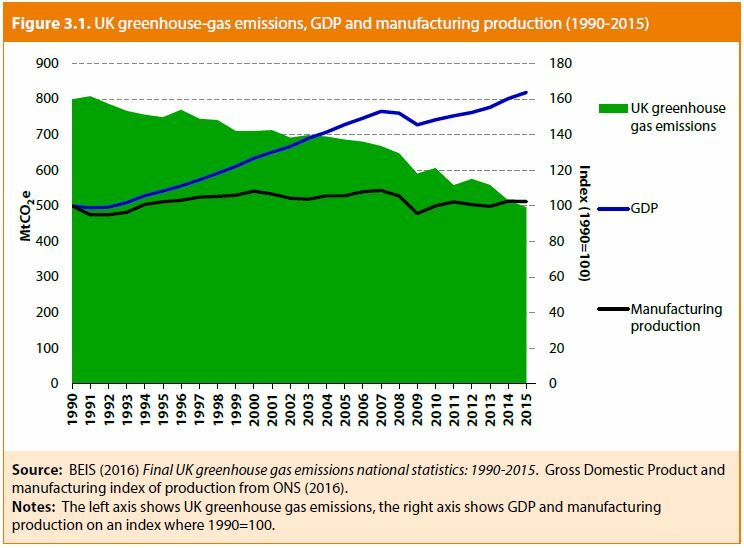 So far, low-carbon policies have not had a major impact on the cost of UK manufacturing. In fact, the UK’s manufacturing output has been increasing since 1990 (apart from during the 2008 financial crisis). This is even with the introduction of stronger low-carbon policies in the early 2000s. These costs do not account for any benefits resulting from energy efficiency policies. If these costs were passed on to consumers in full, they would add 3p to a £10 basket of goods in 2016, and 6p by 2030. Industrial sectors with high carbon emissions receive compensation towards the costs of low carbon policies. This can reduce the cost of using low-carbon energy by up to 80%. The transition from high-carbon to low-carbon products presents opportunities for UK businesses, including those currently producing high-carbon products. Our Energy Prices and Bills 2017 report and infographic look at recent changes to UK energy prices for households and industry.